Participating in a national ecological research project allowed Rebekah Grimes ’17 to relive fond childhood memories. 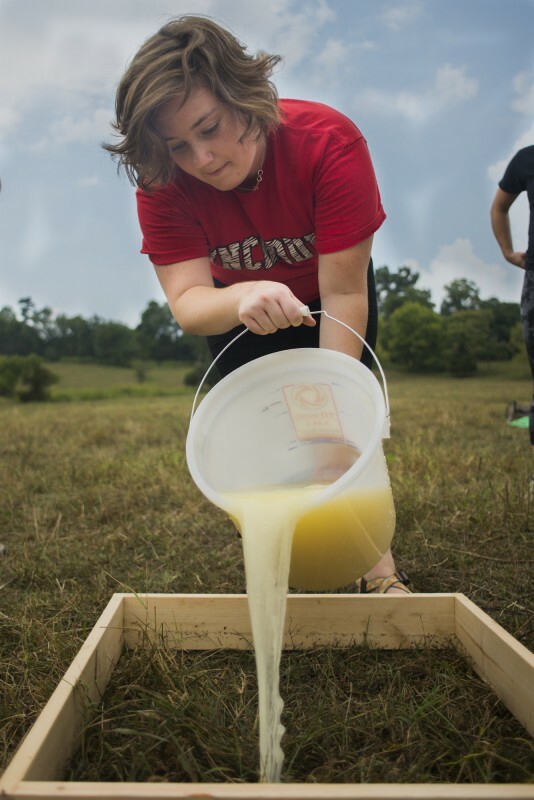 While she and her classmates searched for earthworms from an urban forest plot on the University of Lynchburg campus, she recalled times when she and her grandfather would go out at night to find nightcrawlers for fishing bait. 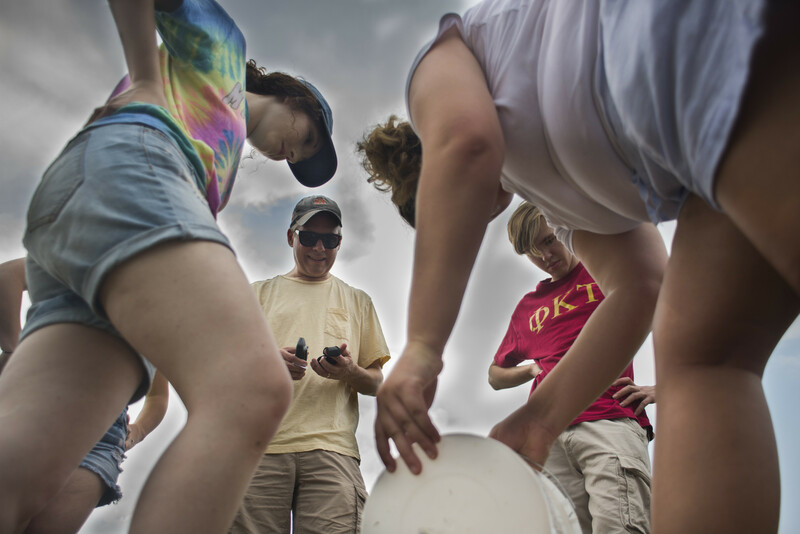 Rebekah and other LC students recently dug up earthworms — and data — for a national study that will help biologists understand the nature of invasive species. Environmental science professor Dr. Jennifer Styrsky learned about the project this summer through the Environmental Research as Education Network. 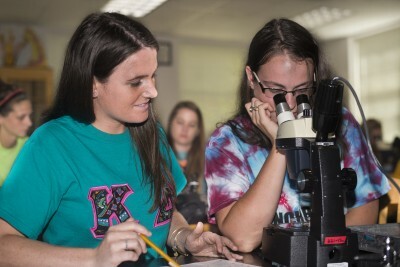 She and her husband, biology professor Dr. John Styrsky, decided to incorporate the project into classes this fall. The project seeks to understand why invasive species of earthworms, such as nightcrawlers, thrive in areas where native species struggle. Because earthworms play an important role in decomposing organic materials, foreign worms brought to North America as fishing bait or composting aides can impact the world around them as they spread. “They have the potential for really altering what’s going on in these ecosystems,” Jennifer Styrsky said. While preparing for the hands-on research, students learned about the effects of invasive species. “The impact of something as small and seemingly harmless as an earthworm was a big surprise,” said Rebekah. Two classes participated in the project. One went to a plot of land on LC’s campus near Faculty Drive. Another went to a cow pasture in Amherst County. To search for worms, the students poured a mixture of water and mustard powder into soil. The mixture irritates worms and brings them to the surface for relief. There, the students gathered about 100 worms to take back to the lab, where they identified the species of each worm. They also ran diagnostics on soil samples to record information about the worms’ habitats environment. Every worm the students found turned out to belong to invasive species. Their lab results were sent to Colgate University, where researchers are analyzing data from all groups participating in the project. The aggregate data will make provide a widespread look at earthworm distribution. The students appreciated being able to learn through a hands-on project with real-world implications. “This has been one of my favorite labs in General Ecology so far,” said Morgan Fletcher ’17, who wants to work on wildlife research in her career. 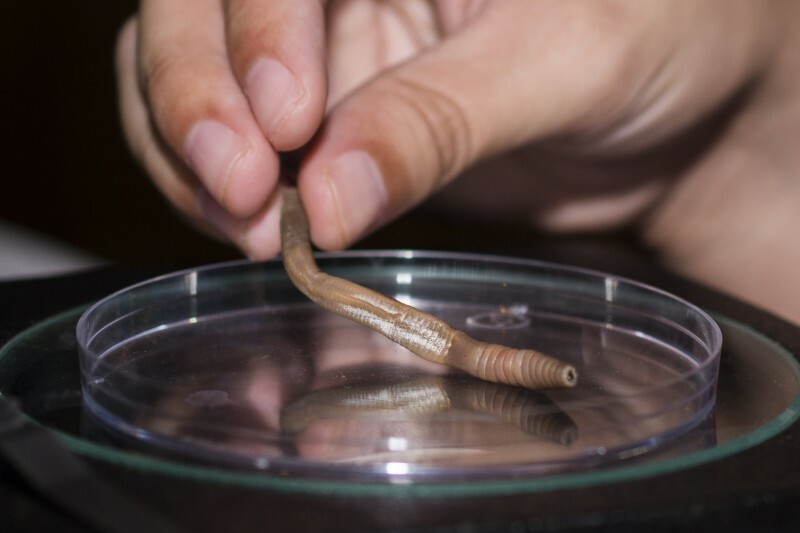 “I hope that the data that we collected is useful and may be used to help curb the destruction caused not only by earthworm species, but other introduced species as well,” said Rebekah.